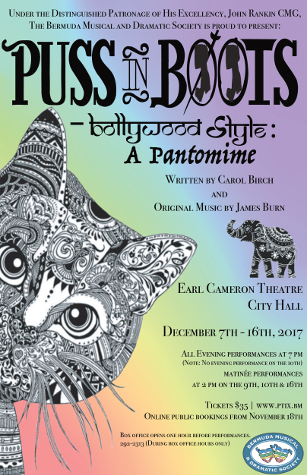 The Bermuda Musical & Dramatic Society [BMDS] Christmas pantomime production — Puss in Boots: Bollywood Style — is set to get underway next month at City Hall. “This is an original production by the creative team of Carol Birch and James Burn, who together have penned previous Bermuda Pantomimes such as Snow White and the Seven Sisters, The Firebird and Sleeping Beauty,” the BMDS said. “The Miller is finally set to retire and hands his mill over to his oldest daughter, his elephant to his youngest and his cat to his “head in the clouds” son. “A cat? Well, this is one very special cat and he’s going to try to help his new owner achieve his dreams of marrying the beautiful princess. But, there’s a very bad man waiting in the wings to get the princess into his own clutches. “Will he succeed? Will someone be able to slay the horrible ogre that is wreaking fear and havoc all through the kingdom? Will the young couple be able to be together or will the evil Vizier thwart all their plans? “Will the Dame finally find the man of HER dreams on the stage or in the audience? You’ll just have to come to the show to find out…. The Christmas Pantomime runs at the Earl Cameron Theatre at City Hall from December 7th to December 16th, with three weekend matinée performances at 2.00pm on December 9th, 10th and 16th, and nine evening performances at 7.00pm. Tickets are $35 each and available through www.ptix.bm, and further information can be obtained by visiting their website at www.bmds.bm.